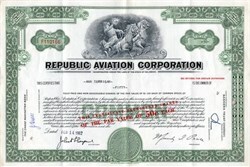 Beautifully engraved certificate from the Republic Aviation Corporation issued in 1962. 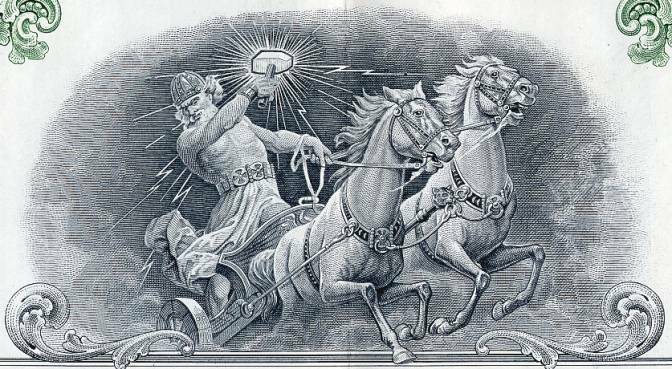 This historic document was printed by the Security-Columbian Banknote Company and has an ornate border around it with a vignette of Zeus with a hammer in a chariot pulled by two horses in the sky. This item has the printed signatures of the Company�s President, and Secretary, and is over 49 years old. Folds from original mailing. Planes produced by the company included the AP-4, an adaptation of the P-35, the first modern fighter. They were delivered in September 1940 as Republic P-43 Lancers. By 1941, new air combat technology had overtaken the Lancer�s technology, and Republic�s chief designer, Russian �migr� Alexander Kartveli, began planning what would turn into the P-47 Thunderbolt. But since the engine that would power the P-47, Pratt & Whitney R-2800 Double Wasp, was not yet available, the U.S. Army Air Corps (USAAC) ordered some almost 2,000 P-43 Lancers to be used in the meantime. Another 108 went to the Chinese Air Force through the Lend-Lease program. None of the U.S. P-43s saw combat duty but served in a training, and later in a photoreconnaissance, role. The P-47 Thunderbolt is ranked as one of the three best fighters of World War II. The plane entered production in early 1942, and early in 1943 began service with Britain�s Royal Air Force as escorts to the B-17 and B-24 bombers. The P-47s could also carry bombs, which turned the fighters into fighter-bombers with the P-47D "Juggernaut," the first large-scale production model. Republic produced 12,602 P-47Ds, the largest number of a single sub-type of any fighter in history. Total P-47D production was 15,660. Republic established a helicopter division in December 1957 and built the French Alouette helicopter. They also made the turboprop airliner�the Rainbow�for short to medium-distance routes. Republic acquired a minority interest in the Dutch aircraft firm Fokker and attempted to market an attack plane in 1960.